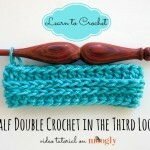 Video Tutorial: #Crochet Half Double Crochet Decreases! 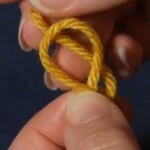 Decreases are pretty basic stuff, integral to shaping your crochet items. Some time ago I covered sc decreasing and dc decreasing, as well as a nifty trick for doing those as invisible decreases. 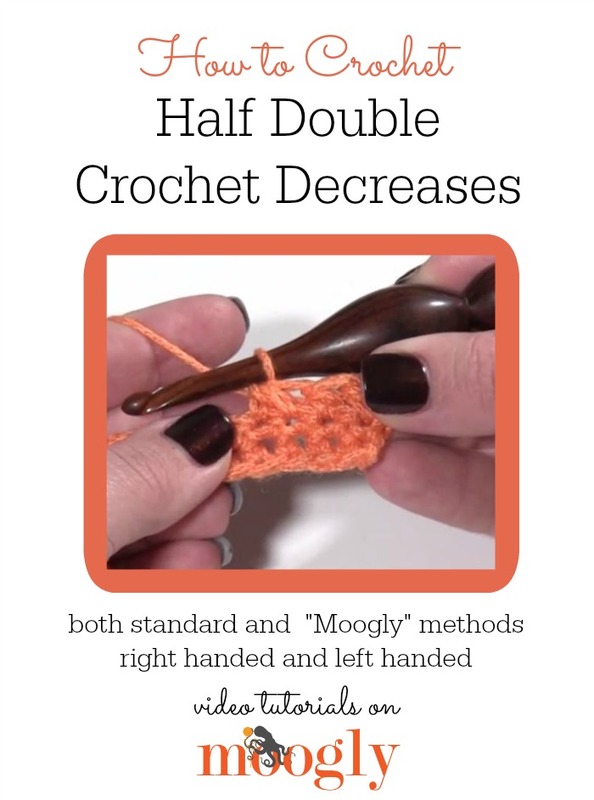 But half double crochet decreases can trip people up – and even when it’s done perfectly the standard way, it can cause a little puff to appear where you might not want one. So today I’ll share the standard hdc decrease method – as well as my own trick for making it look even better! The standard method of hdc decrease, aka hdc2tog, is as follows: yo, insert hook into the next st, pull up a loop, yo, insert hook into the next stitch, pull up a loop, yo and pull through all 5 loops on the hook. Effective, trusted… and a little thick. The Moogly method (which I’m sure someone else has also come up with, but I haven’t personally seen elsewhere but my own hook) is thus: yo, insert hook into the next st, pull up a loop, insert hook into the next stitch, pull up a loop, and pull that same loop on through the 3 loops on the hook. A little different, but I think the end result looks a lot more like a standard hdc! Some yarns and projects will respond better to either method – experimenting is the only way to decide which method to use when. But it’s just one stitch, so it’s not too much frogging to do to figure it out. And you might find that some other variation works best for you too! 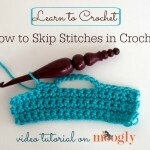 Either way, I hope this video has helped you crochet better today! Thanks for watching! Get Moogly on your favorite social media sites: Facebook, Twitter, G+, Pinterest, Instagram and Tumblr, and sign up for the free weekly Newsletter so you don’t miss a thing! Thanks for sharing this clever trick and for putting together such a clear video to explain it! 😀 Thank you Kate, I’m glad you like it! Thank you for sharing your way of doing this. I’ve always done it the “traditional” way. I like how your method looks. I’ll give it a try next time. Thanks so much for sharing this! I’ve been working on beanies and have avoided patterns with an HDC decrease as I couldn’t figure it out. Your way makes so much more sense and now I think I can tackle those HDC decrease patterns! Thank you! Your tutorials are some of the best I’ve seen. Everything is explained clearly. That’s one of the reasons I so enjoy your website. That and your creative mind. 😀 Thank you so very much Judy!! Great video! Not only was it clear & concise, the sound was excellent. I’m hearing impaired, & have found that other craft videos are very difficult to hear because they didn’t edit out background noise, echoes or the speaker’s breathing. Keep up the good work. Thank you so much Laurel, I’m so glad to hear it! Thanks for that bit of news .Decreasing half dbl cro was really easy for me. But I do like the decrease the puffier way. So have the best of 2015. Thank you so much Hilda! You too! I love your way of doing decreases. I’ll be using it. Thanks so much. I too had ‘discovered’ this method several years ago… but I was working on a pattern today and for some reason it occurred to me that I might be forming this decrease incorrectly. So I went looking for official instructions. I am so glad that you shared both- it makes me feel much better about my choice to keep at it the way I have been! I always say, do whatever works! 😀 The “right” way isn’t always the best for a particular pattern. I’m so glad you found the video!! Thanks Tamara! I love using the hdc stitch but haven’t been happy how the decrease looked. So glad I found this blog posting. Just doing one round with your technique has made a huge difference in my project. I’m so glad it helped! Thank you Andrea!